When The Middle works, it's almost always due to the valiant performance of Patricia Heaton. One of my biggest issues with the entertainment industry is that it doesn't seem to have a clue about the socio-economic situation of most Americans. How many times have you watched a movie where a "normal, middle-class" family lives in a 5-bedroom house? Or a TV show where the family lives in a huge house and the kids all share a room? What about the fact that characters in movies and shows will just jump on a plane at a moment's notice, as if flying isn't the most expensive thing ever? Then there's shows like Modern Family which until recently didn't seem very modern as it portrayed three households where only one person was employed. I realize that these things are fiction and meant to be taken lightly, but after a while, the pattern becomes irksome. That's why I'm glad that there's a show like The Middle, which may be exaggerated at times, but often nails its portrayal of daily life for many families. The Middle depicts the lives of the Heck family, who live in Orson, Indiana. Frankie (Patricia Heaton) is a frazzled mom who tries her best to make sure that everyone is happy. Mike (Neil Flynn) is a stoic dad who works in a quarry, loves the Colts, and hates displays of emotion. Axl (Charlie McDermott), the oldest child, is a below-average student who is good as football and bad at keeping his clothes on. Sue (Eden Sher), the middle child is an eternal optimist and tries out for everything at school, despite the fact that she rarely makes it. Brick (Atticus Shaffer), the youngest child, always has his head in a book, has trouble making friends, and has a nervous tick which causes him to repeat words. Life in the Heck household is always quite frantic and there is usually a problem with work or school. With little money and even less patience, Frankie and Mike try to find a way to get by. Season 4 of The Middle finds the family facing some new challenges. Early in the season, Frankie loses her job as in car sales (something in which she never excelled) and decides to go back to school to become a dental hygienist, which means that the family is bringing in even less money. (For some reason, they never mention the fact that Frankie had a job as a receptionist at a dentist's office at the beginning of Season 1. You would think that would've influenced her decision.) Axl begins his senior year of high school (after attending summer school) and begins to wonder if his football skills will lead to a scholarship. Sue gets her learner's permit and continues to find new activities to pursue at school. In order to teach Brick responsibility, Frankie and Mike let him get a rabbit...which doesn't work out well. The season features some nice guest appearances, such as Norm McDonald as Mike's brother, Dave Foley as a school counselor, and Brooke Shields as the Heck's trashy neighbor. The Middle is one of those shows which is good, but never great, and has remained solid throughout its run. As with any long-running show, it's obvious where the writers sometimes struggle, especially when it comes to Brick. They've written themselves into a corner with him and it's difficult to find new way to challenge his issues. Having said that, at least through Season 4, they've handled the fact that child actors age quite well. (Season 5 is a different story.) Despite these lumps, you can always count on The Middle for two things -- at least truly funny moment per episode and one plot-point which feels as if it were plucked from real life. It's that second component which makes the show work. While much of the show is exaggerated, such as the fact that the family eats out every night or that Brick sits in a lawn chair at the table, the truly true nuggets always make me nod in approval, especially when Brick waits until the morning to announcement that something is needed for school that day. (It's so true that it's painful.) The show also derives a great deal of humor from Mike's detached reaction to everything which is juxtaposed to Axl's rants, which are always funny. Now that it's in syndication, I think that more people are beginning to discover The Middle. I've found that it's one of the few family-friendly sitcoms which is on right now, which means that parents and siblings alike can see themselves reflected in the show. 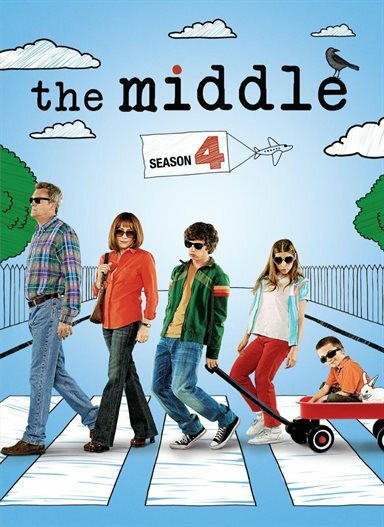 The Middle on DVD courtesy of Warner Home Video and the 3 DVD set contains all 24 episodes from the show's fourth season. The show has been letterboxed at 1.78:1 and the transfer is enhanced for 16 x 9 TVs. The image is sharp and clear, showing no grain and no defects from the source material. The colors look good and the image is never overly dark or bright. The depth and level of detail are what one would expect from a modern sitcom. The image certainly rivals HD broadcast quality. The DVD carries a Dolby Digital 5.1 audio track which provides clear dialogue and sound effects. Again, being a modern sitcom, we don't get a lot of dynamic effects here. There are some occasional stereo effects which illustrate a sound coming from off-screen or something passing across the screen. But, for the most part, the audio is confined to the center and front channels, while the surround speakers and subwoofer rarely get involved. When The Middle works, it's almost always due to the valiant performance of Patricia Heaton. Her turn as the overworked, overstressed, underpaid and underappreciated mother is a frantic thing of beauty; a believable and precisely-timed piece of work that often pulls the show from the realm of silliness into the real world. It's in her character that The Middle captures its potential: a portrait of the strain the current state of the world is putting on ordinary working-class parents. Considering that far too many television characters seem to live laughably comfortable lives free of significant financial worries, it's a nice change of pace to see someone who genuinely does have to be concerned about getting the electric bill paid and feeding the kids. If only the show played as quiet counterpoint to Heaton rather than attempting to match the impressive frenzy she inevitably reaches in many episodes, The Middle might have been a minor masterpiece. Download The Middle from the iTunes Store in Digial HD. For more information about The Middle visit the FlickDirect Movie Database.